Every week, we give out over $6,000 in prizes, and all you need to participate each weekly is ONE TOP 3 FINISH!! 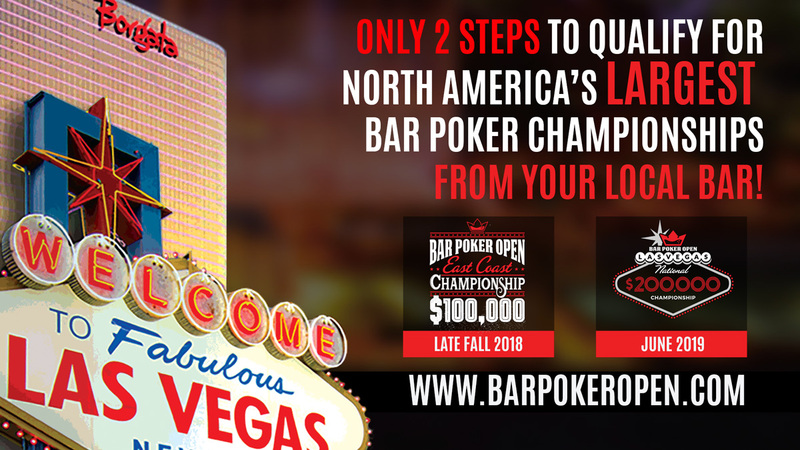 Just show up to your local bar or restaurant hosting “BPO Qualifiers”, finish Top 3, and your able to play for $6,000+ in prizes that include a full Vegas Vacation and BPO Championship Seats for access to our $300,000 $450,000+ in annual championship prizes + over 100 Vegas Packages that will be given out this year! This qualification process does not take a long season of points and multiple championships to qualify, just two simple steps for some fast and immediate qualification! First Place even wins a Full Vegas Package! What If I Win More Than 1 Seat? Players cannot win more than 1 Seat into Each Championship and there is no cash out policy. Players are still welcome to play online weekly and play for the Full Vegas Package and each additional seat is an entry or rebuy into the “Masters Tournament”. You are also welcome to hold on to your tokens for more online special events like our “High Roller” Events if you do not wish to play for Masters Seats. You win your Choice of Championship! Either the $100,000 East Coast Championship or the $200,000 National Championship. Either way you are in once of the Largest Bar Poker Championships in America! You win a seat into the Master’s Tournament *NEW*. This incredible tournament will be for a DAY 2 SEAT into the $100,000 East Coast Championship! You will get an average stack of 250,000, be immediately in the money on day 2, and get a bye past 90% of the field to play for the massive $100,000 payout! Once players have won 3 seats during the time period of June 17 – October 1, the 3rd seat and beyond are converted into “Masters Tickets”. These masters tickets become buy-ins/rebuys into the Online Masters Tournament on October 13, 2018. In this event, you will play against a very small field of players who have also achieved 3+ seats for a seat into Day 2 of the East Coast Championship! Is there not a 10+ seat level this time? There still is, you can see that in your player dashboard status bar.